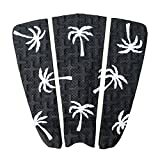 Surfboard traction pads, deck grips, tailpads. There are several names for this piece of grippy foam that most shortboards and a few longboards have on the end of the deck. Put simply, traction pads give your rear foot a bit more grip on the board, allowing you to pull harder maneuvers without having to worry about whether or not your wax is sticky or bumpy enough. 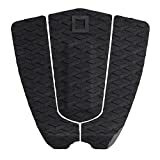 Some surfboard traction pads have ridges at the back that allow your foot even more control over the board for harder snaps and aerial maneuvers. There are several brands of surfboard traction pads on the market, and it’s tough to go wrong since traction pads are a relatively simple piece of equipment. I personally recommend DaKine tail pads, however Gorilla Grip and OAM produce good tail pads as well. Color: This is up to you. One word of advice, however, don’t get a white traction pad. The guy at the shop said it wouldn’t get dirty, but it did. He was probably trying to get rid of it! Now it looks a little trashed, but it still works fine. Applying a tail pad to your pristine surfboard can be a little nerve-wracking, but there is a very simple way to do it. FIRST: Make sure there is NO wax on your board. If it’s brand new, take a cloth and wipe away any fiberglass dust that might be on the board from production. If you’ve had wax on it, leave it in the sun for a few minutes to soften the wax, or pour hot water on it. Then scrape away the wax from the area with a wax comb or other soft plastic edge (your old credit cards work well) and finish with a wax remover. If it’s winter, you can take a hairblower on a LOW setting and blow the wax until it is soft enough to remove. Make sure that you wipe away all the wax remover and bits of wax. Cut the plastic around the edge of the tailpad and remove the cardboard backing—but leave the pad itself in the plastic so it stays together. Put the tail pad on the board (still in the plastic) and figure out where you want it to go. Some surfers like to have the rear kick-up ridge positioned either directly over the front of the centermost fin, others like to have it right in front of the leash plug. If this is your first traction pad, a safe bet is to put the rear ridge over the center of the middle rear fin. Mark off the position of the pad with a pencil. Use the stringer to make sure you’ve got your pad centered. Peel off the adhesive paper on the pad, being careful not to let the glue stick to anything. Take the entire pad and carefully place it onto the area marked with your pencil. Press down firmly for about 20-30 seconds to bond the adhesive. Carefully peel away the plastic packaging. It’s advised to wait a day to use the board, but I’ve heard of people going in the water right away. It’s up to you, but I’d recommend waiting at least 12 hours. That wasn’t so hard now, was it? Some people like to spread the pieces of their traction pad around wider or tighter than the factory “preset.” If you want to do this, just take a pencil and trace the different pieces individually. You can use a little piece of double stick tape so they don’t move around as you arrange them. This is difficult, and is easier on epoxy boards than fiberglass boards. If you want to remove a tail pad from a fiberglass board you run the risk of delaminating the board, pulling the fiberglass away from the foam. This could ruin your board, so it’s not recommended. If you MUST remove the pad, do it very, very slowly and carefully, a little at a time. If you’re going to put a new pad on, don’t worry about a little sticky adhesive left over. If you just want to get rid of the thing completely, a small amount of paint thinner on a rag or paper towel should take care of the adhesive. The DAKINE Andy Irons Pro Model Traction Pad won't help you surf like the man it's named after. Skills like that only come from a life spent surfing and instruction from a father named Phil Irons. But a traction pad will help you power through cuts and hold on in big spins. And you can think of the three-piece design as a means to spread his legacy on your board. The Dakine Andy Irons Pro Traction Pad is designed to help you grip your board like iron to a magnet. Featuring 3 large sections, the Andy Irons pad is made out of full EVA and features a 10mm center arch and 20mm kick tail to help you get fully pitted like the man himself. Add some awesome grip to your board with this Superlite Surf Traction Pad from Dakine. The Superlite Surf Traction Pad is a three piece pad with a 7mm center arch and a 25mm rolled ramp tail kick with beveled corners. A very high quality product, which will enhance the look and feel of your board. Cut outs enhance board feel and increase grip. 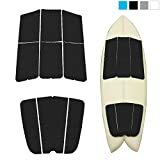 Punt Surf Ripper Traction Pad - 3 Piece Stomp Pad for Surfing and Skimboarding with 3M Adhesive. Grips All Boards - Surfboards, Shortboards, Longboards, Skimboards. SEE THEIR JAWS DROP: Our traction pad provides the ULTIMATE, LIGHTWEIGHT grip for you. Dig your back foot in with confidence on those critical bottom turns and cutbacks. FITS ANY SURFBOARD & SKIMBOARD: You can place this 3 piece traction pad as you please. Spread the pieces out for wider boards, put the pieces together for narrower ones. Dimensions: 10.5" x 11.75", 10mm center arch, 25mm tail kick. PUNT SURF 100% STOKE GUARANTEE: Our traction pads will stick forever on your board or your money back, no questions asked. We're a homegrown company from California, and our mission is to provide premium surf, skim and SUP accessories for all. We love being in the water, and we're always testing our products to ensure they are the best out there. We're confident you'll be stoked! LOVE OUR PLANET, CHOOSE PUNT SURF: For us, making premium products for all isn't enough. We are a highly environmentally conscious company that cares about giving back. As a proud member of 1% for the Planet, we donate a portion of every sale to nonprofits dedicated to protecting our oceans and environment. Improve your form and stay solid on the board with the Dakine John John Florence Pro Traction. Designed and developed with JJF's direct input, this exclusive pad features drilled holes to reduce drag and enhance water flow. The super tough adhesive holds the pad in place for more secure turns and massive pops. This exclusive tail pad has been designed, researched and developed with the Hawaiian mega star who is probably the best pound for pound surfer on the planet right now. From hyper grippy traction and an ultra protective board bag to green friendly plastic less packaging built from recycled paper, this collection is all about pushing the limits of surf accessories so one of the world's most progressive riders can continue to change the game. PREMIUM QUALITY - Other traction pads on Amazon claim to be high quality, but they are smaller and the adhesive is not as good. You know you are getting quality with Ho Stevie! FULL SIZE PAD - 12"x12" when all 3 pieces are laid side by side. Spread the pads apart if you prefer a wider grip on your tail. 100% SATISFACTION GUARANTEE: As with all of our products, if you are not completely satisfied for ANY reason, simply return it within 30 days for a full refund. NO MORE SLIPPING OR SLIDING: Our 20in x 20in traction mat gives you ultimate non-slip grip on your watercraft or board while channeling away excess water. EASY TO CUSTOMIZE, PEEL & STICK: Our traction pads are super easy to customize and install. Simply trim it (if necessary), then peel & stick the pad to your surfboard, skimboard, SUP, skateboard, watercraft or anything that needs traction. PUNT SURF 100% STOKE GUARANTEE: Our traction pads will stick forever on your board or your money back, no questions asked. We're a homegrown company from California, and our mission is to provide premium boating, surf, SUP & skim accessories for all. We love being in the water, and are always pushing our products to the limit to ensure they're the best out there. We're confident you'll be stoked! NO MORE SLIPPING OR SLIDING: Our 34in x 9in traction mat gives you ultimate non-slip grip on your watercraft or board while channeling away excess water. SUPERIOR ANTI-SLIP TRACTION: In 3mm depth diamond grooves, this trimmable EVA pad provides a nice textured surface with excellent grip. CUSTOMIZE TO FIT: It has 9 pieces and separates into upper section and tail section (comes with arch and kicker). It's suitable for both SUP boards and surfboards, by adjusting the space of the pieces. Taking out the 2 middle pieces of the upper section, it's perfect for narrower surfboards. PREMIUM QUALITY: Along with the brand new A-grade EVA material, all Abahub traction pads utilize certificated resin and original marine grade 3M self adhesive backing. Our processing experience also guarantees the superb stickiness won't be compromised by EVA dust generated during production. SOFT AND COMFORTABLE: Made of elastic A-grade closed cell EVA foam, it's also an absorber of weight and shock. It helps reduce your foot fatigue with a perfect balance of traction and comfort. 100% SATISFACTION GUARANTEE: We've been manufacturing traction pads for over 10 years. We know what we're doing and we stand by our products. If you're not happy with our products, we'll offer you replacement or full refund with "No Question Asked" guarantee. use a air dryer and heat the pad a little and make sure your board is at least 72 degrees Fahrenheit. then stick it on and press down all over it and especiallyt the edges. Thanks Guys for the infos. The only problem I have with my traction pad(which came with the board) is that it does not stick too well to the board. What can I do, or with what can I stick it back on again? I have a TrenchTown TT Pro 6.0 if that should matter. Thanks for an informative article. Up until now i have been sitting here looking at my new traction pad and wondering where exactly I should put it lol. Just one question tho before i go ahead and stick it on, does the placement remain the same for longer boards? I have an 8′ minimal.